Lodging is available for $87 per adult and $67 per child under 18. Book here. Currawong is home to Nanga's main (and only) stage. Currawong caters to those looking for a late night or two (or three) full of sing-alongs, jams and socialising. Nanga offers ear plugs if you aren't the last one to bed! If you plan to self-cater, Currawong has a fully set up kitchen with a fridge, cooking facilities, kettle, microwave, cutlery etc. Also, our coffee/chai man is located at Currawong. Yum! Timbarra is a beautiful lodge set between the concert and meals areas. Not as lively as Currawong, Timbarra is often the scene for a quieter songwriter jam around the fire. Timbarra is also a choice for self-catering with a fully functional kitchen like Currawong. 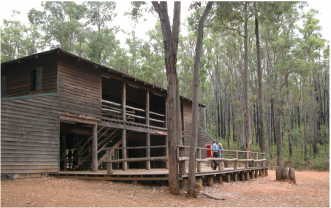 This year our workshops will be held in Timbarra. Catered meals are served in Woodshed so there is no capacity for self-catering here. Woodshed is best for those who like to get to bed (and rise) early. It's also the most suitable venue for young families. Nestled next to Woodshed is the Listening Gallery where you can quietly enjoy some open mic performances while having your meals. Woodshed is also home to our Saturday afternoon sing-along. It is also the meeting point for the bush walks. Self-catering kitchens are also available in two lodges - Currawong and Timbarra (not Woodshed). Keep this in mind when booking your preferred lodge, if you plan to self-cater. See details about the lodges above.